This is a gorgeous looking feeder which will make an inspiring decoration of any outdoor space, featuring three plastic chambers holding seeds, an attractive metal cage with a rustically looking brown finish and ornamental leaves which are not simple ornaments. It looks great but there are some flaws to the design aslo, i am going to write about them in this article to. The bird feeder comes with the weight sensitive outer cage which is designed to protect the containers holding the seeds. 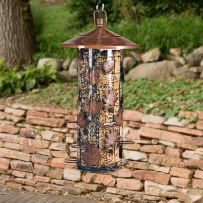 In case a squirrel should climb onto the feeder, the spring-loaded outer cage falls down, frightening and unbalancing the squirrel, and at the same time lowering the mentioned ornamental leaves into a position where they cover the seed containers and stop the squirrels from stealing the seeds. Simple settings enable you to adjust the tension of the cage’s spring mechanism as necessary for the squirrels. This is a good idea, but one flaw is that the springs are accessable by squirrles as thay are placed on the outside. The squirrles can damage the springs by walking and hanging on them, and this can make the closing mechanism less functional. The feeder features nine seed ports which uniformly distribute seeds for the birds and U-shaped metal perches which birds love because they allow them to sit and feed. The birds don’t weigh enough to trigger the lowering of the cage, but in case a squirrel shows up, no more seeds. The tube ports are made of plastic, and can be chewed on by squirrels if the mechanism is not closed for some reason, in this case metal is preferable. The Squirrel-Be-Gone III Bird feeder for wild birds comes preassembled out of the box. The feeder can hold up to 8 pounds of seeds (for example peanuts, black oil sunflower or any mixed seeds). You can fill all the chambers with the same seed or place different type in different chambers so as to attract various birds. 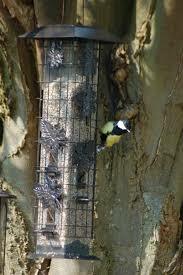 After you fill the chambers, just hang the feeder in your garden in some secure quiet place. The seed quantity and versatility is a plus to this bird feeder, as you can attract larger variety of birds to your backyard. Overall seed capacity of 8 lb. This feeder for wild birds is equipped with a wire loop so you can hang it near your porch, back deck, patio or even a window overlooking your yard or garden. You should pick a location that provides you with a clear view of the birds but which is also bird friendly. They prefer opens paces, allowing them to freely move between feeding ports. But they also prefer a location which has both sun and shade during daytime. An ideal location would be no more than 15 feet distant from nearby bushes or shrubs, so the birds would feel like they can hide from potential predators, and you should hand the feeder some five or eight feet above the ground. A southeastern exposure with wind protection would be your best choice, as the birds enjoy feeding in the sun but protected from wind. They also like clear lines of sight so they can spot potential threats. If this is the first time you have placed a bird feeder in your garden, it is not uncommon for the bird to take as much as several weeks to discover this new source of food. You can help them by placing a shiny pie pan underneath the feeder and filling it with seeds. This will attract birds flying overhead. Chose black oil sunflower seeds for they are loved by the greatest number of birds. Water will also serve to attract birds. Take care not to hang your bird feeder too close to trees, fences or buildings. Squirrels, cats or other predators could use those to climb onto the bird feeders. If you don’t have any other option than a tree, make sure you hang it at least six feet away from the trunk or tree limbs. The plastic around the eating holes can be chewed by squirrels if they figure out how to get to it. If they chew on the feeding ports the seed will not hold, and will be wasted. The spring s of the closing mechanism is on the outside, and it is in my opinion to exposed, this makes it reachable by squirrels and rust. Because of that the closing mechanism can start jamming if the springs are damaged. One more thing I have notices is that if the feeder is spin around by wind or squirrels this can in some cases unscrew the top hanging hook and the feeder can fall down on the ground. The see-through plastic compartments allow you to easily determine seed levels with a glance. Take care to keep the bird feeder clean and always stocked with fresh seeds to ensure healthy birds which will keep returning to your feeder. I suggests you should check for insects or mold at least once a week and clean the entire feeder every couple of weeks with mild soap and water. Birdhouses can be a great way to attract bird species which prefer nesting in holes in the trees. The bird house can be constructed out of untreated wood (like pine, cedar and others) and should feature holes for ventilation and drainage. Bird houses should be weather resistant, and simple to check and keep clean. You should first choose what species you aim to attract (for example, bluebirds, flickers and wrens are all nesting species) and then make sure you construct a bird house which is adequate for those species. Also, check if that species is even native to your area of the country. This bird feeder looks great and looks lovely , the seed versatility and capacity is a plus, but comes with some design flaws like the plastic feeding holes and closing mechanism springs accessable to the squirrels. If the squirrles are not a major problem then you can give it a go. If for some reason you’re not completely satisfied with this bird feeder, Perky Pet offers a 30-day satisfaction guaranteed policy.